Habit: Shrub to tree, glabrous, hairy, and/or with glandular scale-like hairs. Stem: prostrate to erect, bark thin, sometimes peeling or shredding. Leaf: alternate, evergreen or deciduous, ovate to obovate to elliptic, margin entire, flat to rolled under. Inflorescence: raceme, 1--many-flowered, bracts green to red-brown. Flower: sepals, petals generally 5, corolla radial to bilateral, 1--5 cm, petals free to +- fused, spots or blotch present or 0; anther awns 0; ovary superior. Fruit: capsule, septicidal, dehiscing base to tip or tip to base, placentas axile. Seed: many, fusiform, +- flat to not, wings and/or tails present or 0. Stem: < 4 m, coarse-branched, twigs stout. Leaf: (6)7--12(17) cm, 3--5(7) cm wide, leathery, evergreen, glabrous, midvein impressed, margin flat. Inflorescence: 1.5--3 cm, 10--20-flowered, bracts deciduous; pedicel +- elongate in fruit. Flower: corolla widely funnel-shaped, white to pink or purple, adaxially brown-yellow-flecked; stamens 10, unequal. Fruit: longer than wide, dehiscing tip to base. 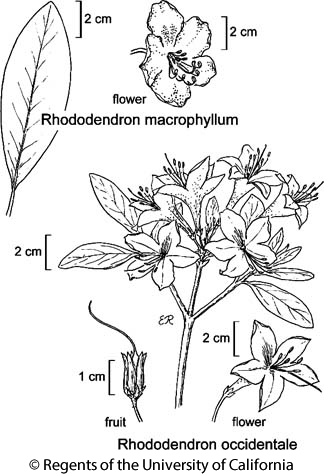 Citation for this treatment: Kathleen A. Kron & Walter S. Judd 2012, Rhododendron macrophyllum, in Jepson Flora Project (eds.) Jepson eFlora, http://ucjeps.berkeley.edu/eflora/eflora_display.php?tid=41146, accessed on April 22, 2019. NCo, KR, NCoRO, CCo, SnFrB; Markers link to CCH specimen records. Yellow markers indicate records that may provide evidence for eFlora range revision or may have georeferencing or identification issues. Purple markers indicate specimens collected from a garden, greenhouse, or other non-wild location.